Researchers at the University of Strathclyde have launched a clinical investigation which could eventually help millions of osteoporosis sufferers by harnessing pioneering ‘nanokicking’ technology – tiny vibrations to turn stem cells into healthy bone. The study, which is led by Professor Stuart Reid and which shows ‘enormous promise’ according to UK Science Minister Chris Skidmore, will apply nanoscale vibrations to patients with spinal injuries in an attempt to slow down and reverse the effects of disuse osteoporosis. This bone loss results from insufficient stresses and strains in the bones following disuse, which weakens the bones in the paralysed limbs and makes them more susceptible to fractures. Professor Reid, who is the co-inventor of nanokicking technology where precise nanoscale vibrations are used to control the behaviour of adult stem cells, said: “These precise nanoscale vibrations have been shown to control the behaviour of adult stem cells which can then be used to start the growth of bone in the laboratory from a patient’s own cells. Science Minister Chris Skidmore said: “Osteoporosis can be a devastating condition for the three million people that suffer from it across the UK. This research shows enormous promise of slowing down and even reversing the disease.“The Government’s modern Industrial Strategy aims to harness medical innovations to help people have the most advanced treatment and meet the needs of our ageing society.”Bone density loss can be extremely fast for people who have suffered severe sudden paralysis and developing treatments to help promote healthy bones and minimise fractures, is vitally important. Although there are existing techniques to persuade stem cells to become bone, they involve complex and expensive engineering or chemicals. The project’s co-lead Dr Sylvie Coupaud, who has experience of rehabilitation interventions in patients with spinal cord injuries, said: “There is currently no effective approach to treating osteoporosis in these patients – it is diagnosed but not treated. According to the National Osteoporosis Society, more than three million people in the UK are estimated to have osteoporosis, which causes around 500,000 broken bones every year. 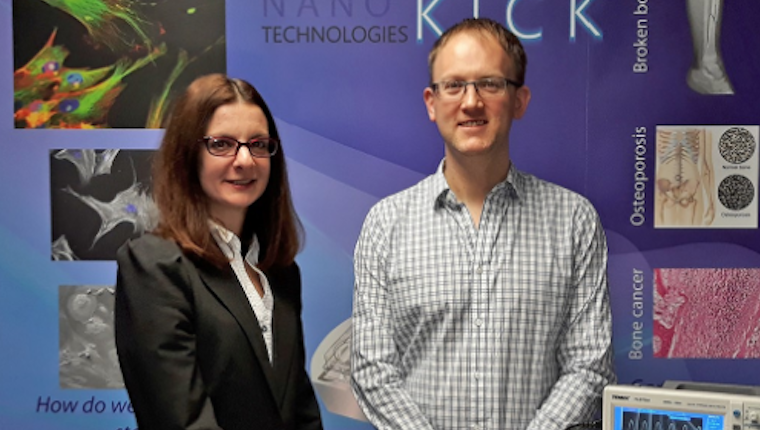 Professor Matt Dalby, the co-inventor of the ‘nanokicking’ technology, was involved in the original stem cell research and is part of the investigator team on this latest project, along with Dr John Riddell, who leads on the biological investigation, both from the University of Glasgow. The two year project has received funding of almost £350,000 from the Science and Technology Facilities Council (STFC), part of UK Research and Innovation, an independent part of the Department for Business, Energy & Industrial Strategy (BEIS). STFC funds UK research in areas including particle physics, nuclear physics, space science and astronomy. Scotland ranks worldwide among the top three for research productivity and impact, with 19 universities and higher education institutions, and world leading research centers, that attract some of the brightest international scientists. Find out more about the access to world leading research in Scotland, here.